President Donald Trump's tweet on Friday. Just a day before the Kansas primary election, President Donald Trump waded into the race for governor while an independent candidate staked out a space in the general election. Trump endorsed Kansas Secretary of State Kris Kobach in his bid to oust incumbent Gov. Jeff Colyer. The two are frontrunners in the Republican primary race, which also includes Insurance Commissioner Ken Selzer and former state Sen. Jim Barnett. Some media reports had said aides were urging Trump not to stay out of the GOP primary, but Trump took to Twitter to back Kobach. “He is a fantastic guy who loves his State and our Country - he will be a GREAT Governor and has my full & total Endorsement! Strong on Crime, Border & Military,” Trump said in the tweet. Koach was an early Trump supporter, which the president noted in his endorsement, and Kobach has been close to the president. Kobach was vice chair of Trump’s election integrity commission before it was abandoned amid controversy. Donald Trump Jr. has also campaigned for Kobach. The Associated Press had reported that staff encouraged Trump not to get involved over concerns about alienating Colyer supporters. Colyer is also a conservative who supports the president, although he’s taken a different tone in the race. The two have traded blows, even though they agree on many major issues such as abortion and gun rights. Kobach has maintained his no-holds-barred anti-establishment style and hardline stance on immigration and other issues. Colyer has sold himself as someone who can work to create consensus and gets things done. He’s been in the office since he took over when Sam Brownback stepped down as governor in January for a job in Trump’s administration. Colyer’s team responded to the news of the endorsement without criticizing the president. “We respect the Trump family’s loyalty, but as Senator Bob Dole made clear in his endorsement of the Governor — Dr. Colyer is the best candidate to win tomorrow and is the only candidate who can defeat the Democrats in the Fall,” Colyer spokesman Kendall Marr said on Twitter. The same day the endorsement drama played out on the GOP side, an independent candidate solidified his position in the race the race for the top elected job in Kansas. 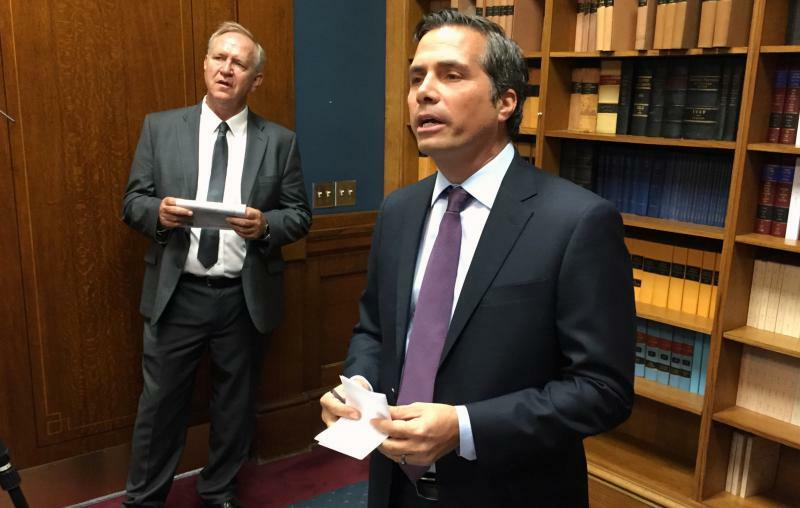 Kansas City-area businessman Greg Orman delivered more than 10,000 signatures to a state office to get his name on the November ballot. Some Democrats have said Orman is a spoiler who is more likely to swing the race to Republicans than to win it himself. But Orman said he’s confident he can form a winning coalition. State officials still need to review the petitions. Orman said he has twice the required number -- enough to survive any challenge.